It’s unlikely that an article praising Franz Schubert would have been published, outside of his hometown of Vienna, during his lifetime. Schubert's reputation of greatness was earned posthumously. He left behind a huge body of work, more than 1,500 oeuvres, despite barely making it into his 30s. His compositions reveal an immense talent for melody—perhaps the greatest of all-time—and a penchant for conveying the full range of human emotions. Schubert wrote more than 600 songs for voice and piano. About two-thirds of those works were published after his death. Many pundits consider his songs to be the musical equivalent of poetry. He didn’t just hang words on a melody; he turned poems into complete musical experiences. Schubert also made immense contributions to other forms including the symphony, the sonata, and the string quartet. Some of his best-known works are Die schöne Müllerin, Piano Sonata in A minor, Piano Quintet in A, Symphony No. 8, Symphony No. 9, and Winterreise. 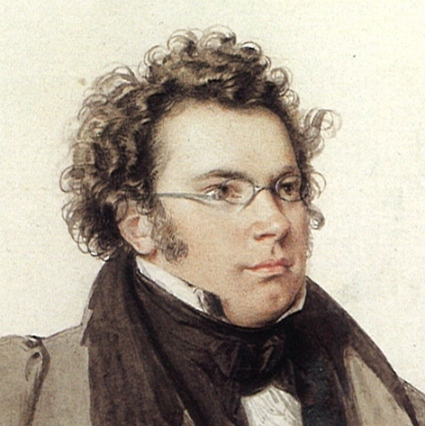 Schubert is regarded as a paragon of the late classical and early Romantic period. Today, his works are performed all over the world and his greatness is only surpassed by behemoths like Beethoven and Mozart. 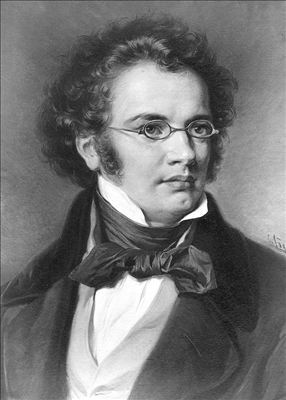 Schubert was born in Vienna, Austria on the last day of January in 1797. His father was a schoolmaster. His mother was the daughter of a locksmith. Schubert’s parents conceived 13 children (his father sired an illegitimate child), but only five survived infancy. Schubert was gifted and absorbed musical knowledge like a sponge. 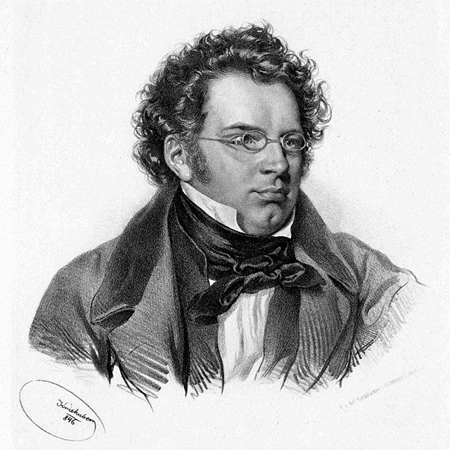 Schubert’s father taught him the violin while his brother taught him the piano. He received his first musical training from someone other than a family member when he was seven. Even so, Schubert never became a true virtuoso on any instrument. In 1804, Schubert’s voice attracted the attention of Vienna’s top musician, Antonio Salieri. Salieri taught Schubert composition and music theory. Their instructor/pupil relationship ended in 1817. In 1808, Schubert received a choir scholarship for Stadtkonvikt, a well-known seminary. Eventually, Schubert wrote works for the school’s orchestra. Schubert left Stadtkonvikt in 1813. The following year he worked at his father’s school as a teacher. Also, in 1814, Schubert met Therese Grob. He wrote several works for the soprano and wanted to marry her. The law prohibited him from doing so because he lacked the means to support a wife. There is much scholarly debate over Schubert’s sexuality. Despite his desire to put a ring on Grob’s finger, some historians believe Schubert was a homosexual. 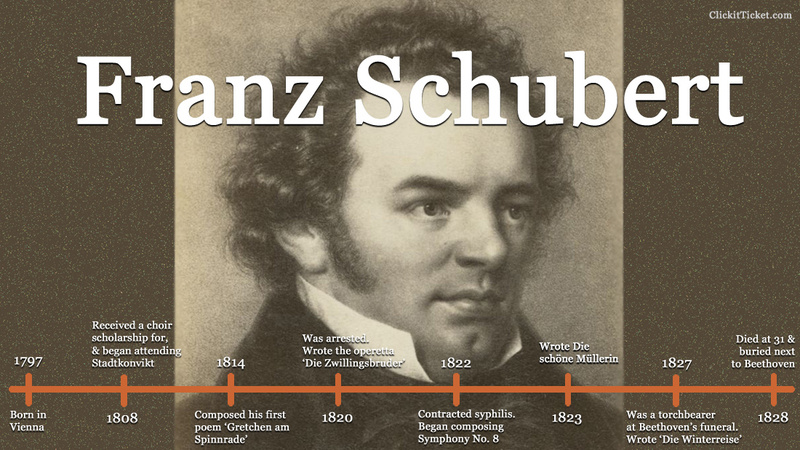 It’s believed that in the winter of 1822-1823, Schubert contracted syphilis. Also lending credence to this theory is the fact that toward the end of his life, Schubert suffered symptoms associated with mercury poisoning. During his era, mercury was used to treat syphilis. In 1816, Schubert failed to land the post of kapellmeister at Laibach and resigned from his teaching responsibilities at his father’s school. He then moved into a home with his good, and wealthy, friend, Franz von Schober. Schubert tried to contribute to the household by teaching music lessons. His endeavors were unsuccessful. With no lessons to teach, he was able to compose a prodigious amount of music. Toward the end of 1817, Schubert begrudgingly returned to teaching. His misfortunates were further compounded by his failed attempt to join the Gesellschaft der Musikfreunde. Had Schubert become a member of the Musikfreunde, he certainly would have achieved fame within his lifetime. Nonetheless, his compositions earned him acclaim in and around Vienna. In 1818, he enjoyed the first public performance of one of his works, a secular overture. Later in 1818, Schubert returned to teaching music. This time to daughters of a prominent count. The gig paid well and allowed him ample time to compose. The beginning of the next decade saw the inception of the Schubertiaden—an event that showcased Schubert’s music. During his lifetime, Schubert’s music was championed by a circle of close friends (many of whom had financial means). Some of his close friends and ardent admirers were Anselm Hüttenbrenner, Joseph Hüttenbrenner, Ignaz von Sonnleithner, Johann Michael Vogl, and Schober. In 1820, Schubert and some of his friends were arrested for what was tantamount to sedition. At the time, the Austrian government was taking a strong anti-revolutionary stance. One of Schubert’s friends was sentenced to a year in prison and banned from visiting Vienna. Schubert was given the proverbial slap on the wrist and charged with "inveighing against [officials] with insulting and opprobrious language." Apparently, using unnecessarily long words to reprimand citizens was completely legal. Also in 1820, Schubert enjoyed the staging of not one but two operas. These professional productions introduced Schubert to a wider audience. It also allowed Schubert, albeit on a level far below his talent, to publish some of his works. Yet, this deal was not financially successful, and his royalties were meager. Schubert continued to write works for the stage, but almost all his efforts turned out to be disasters. A variety of reasons contributed to the failure of these productions—politics, the popularity of Rossini’s operas, poor staging—but, the quality of Schubert’s music was not one of them. In 1822, Schubert started composing Symphony No. 8 in B minor, sometimes numbered as Symphony No. 7. In one of music’s greatest mysteries, he never finished it. Some scholars believe he failed to finish the opus because the first two movements are basically in the same meter. This was very rare for Schubert’s time. Other musicologists suggest the symphony was left unfinished because he associated the work with contracting syphilis. Other say he decided to put all his energies into his Wanderer Fantasy. Adding to the mystery of his incomplete masterpiece is the fact that he didn’t seem to mention the work (or the reason for leaving it unfinished) to his friends. Odd for a man who had a such close cadre of companions. In 1823, Schubert wrote Die schöne Müllerin. For this work, he set the poems Wilhelm Müller to music. Die schöne Müllerin is a song cycle or a group of songs intended to be performed as a group. For the rest of his life, which ended in 1828, Schubert continued to compose masterworks. Not much of note happened during this stage of his life, except his finances improved and his health deteriorated. He spent the last few weeks of his life at his brother’s home. He endured bouts of vomiting and suffered from swollen joints, headaches, and a fever. Schubert died on Nov. 19, 1828. He was just 31. The last work he listened to was not his own, but Beethoven’s. It was his String Quartet No. 14 in C-sharp minor. Schubert was buried next to Beethoven. A year earlier, Schubert had been a torchbearer at Beethoven’s funeral. Both composer’s graves have since been moved. Their original funeral grounds have been turned into a park and renamed Schubert’s Park. Schubert did not set the full Roman Catholic prayer of “Ave Maria” to music. Schubert’s use of the phrase obviously inspired arrangers to adapt the melody to fit the entire invocation. Due to its use by the church, and its haunting melody, “Ave Maria” has become Schubert’s most popular work. The New York Times ranked Schubert as the fourth greatest composer of all-time. Schubert stood less than five-feet tall. 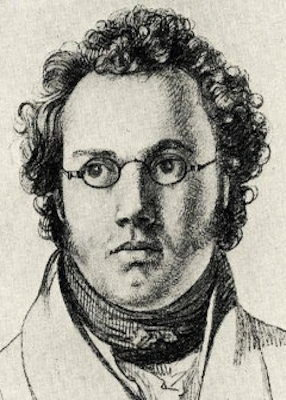 Schubert suffered from poor eyesight and his facial complexion was pocked. The Schubert family had their own string quartet. Franz played the viola. During the calendar year of 1815, Schubert wrote more than 20,000 bars of music. In 1822, Schubert met Beethoven. Schubert’s opera, Fierabras, contained over 1,000 pages of manuscript music. Schubert’s music can be heard in the 1940 Disney film, Fantasia. Schubert drank and smoked heavily. He was also known to be sexually promiscuous.